Category Archives for "Baby Crib Mattress Reviews"
A mattress is something most people have a hard time deciding on, especially when it is a mattress for a newborn. It is recommended that a crib mattress be firm, well-fitting inside the crib, and waterproof. From there, some parents also want them to be made of only natural material, such as soy. Others are content to have foam mattresses. Which do you prefer? 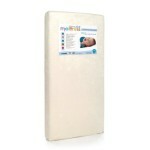 If you are like most, you want something along the lines of a My First Mattress crib mattress with a waterproof cover. Read more to find out why some reviews say this is “the best” mattress ever. The My First Mattress memory foam crib mattress with waterproof cover is made using high density foam to be comfortable while it supports your sleeping infant. With this mattress you will be able to rest easy knowing that your little one will not be forced to roll toward the middle instead of lying flat on their back. It meets all CPSC standards as well as the federal flammability standards. It is also mite-proof, phthalate free, and hypoallergenic to further give you peace of mind about where your baby is sleeping. This crib mattress has square cut corners as opposed to the rounded corners to ensure that it will fit snugly inside of the crib frame and later when your infant is ready for a toddler bed. Can you imagine how great it will feel to never have to worry that your little one will get their arms or feet trapped in a hole between the mattress and crib rails? It does come with its own waterproof crib mattress cover. The cover is made with 100% polyester. This means that it is a soft velour. It is removable and washable to help you feel confident that your child is sleeping on a clean surface, even after accidents that may sometimes occur during the night with a little one or a potty training toddler. The My First Mattress memory foam mattress has a 10 year manufacturer warranty. This will cover your child through all the years that they will possibly use it, and perhaps cover other kids you may have in the future. It ensures that you can buy with confidence, knowing that if anything goes wrong with your mattress you can get it replaced. Another great thing about this mattress is that it is only 11.5 pounds and fits most standard sized cribs or toddler beds. At 51.6x5x27.2 inches, it will be a snug fit, but not to the point that it will be impossible to put on crib sheets. As you read through the reviews on this crib mattress you will discover that most people feel it is a wonderful mattress for their child. A lot of them say that it is firm enough to be safe, but not so firm that an infant will sink into it. Owners say that the baby mattress cover is soft and not as plastic-y as they would have thought when reading that it was waterproof. Instead, they claim that it feels fuzzy in a way. 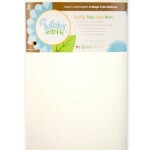 Some parents opt to use only the cover an infant crib sheet because it is so easy to wash it and comfortable. However, a majority of parents still use standard sized crib sheets as well. There are also those people who feel that it is too soft to be safe for the smallest infants. They recommend that it is great for toddlers only. This mattress is slow to arrive as well, occasionally. There are people who have been waiting a couple months to get the mattress. When it arrives, it will be compressed, which means that you will have to wait for it to fully reach its full 5” thickness. This could take a couple days. There are also some people who feel that true, to how other memory foam mattresses are, there may be a slight odor for the first few weeks after you open it. A lot of people do not like the odor and worry about their child sleeping on it after they smell it. Is The My First Crib Mattress What You Are Looking For? One of the hardest things to do for any new mom is finding things that they feel are going to be best for their baby. Most new parents spend hours studying up on how to ensure toys are safe for their little ones, sterilizing bottles, preparing their baby’s clothes, painting the nursery so it is function-able and safe, and more. The same thought and consideration must also go into the type of crib and crib mattress that they choose. 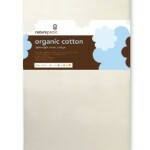 Perhaps that is why one popular option for new and expecting parents is the Naturepedic organic cotton crib mattress. However, because it is one of the most expensive mattresses on the market, you have to ask if it is really worth it. Here is the reason why most parents seem to feel that it is. 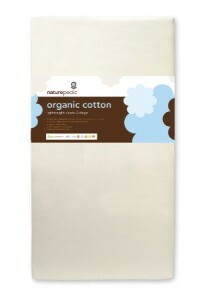 This crib mattress is made of 100% certified organic cotton fabric and filling. 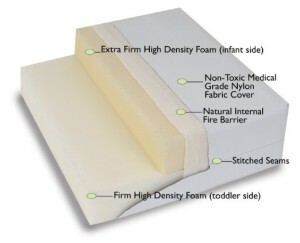 It is made in the USA and meets all of the recommended mattress safety standards for both infants and toddlers. 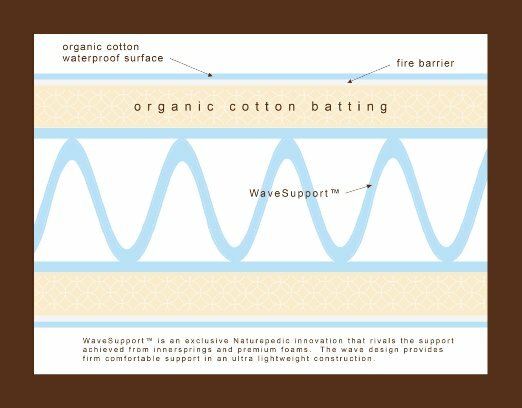 For the design of the patent pending Wave Support technology and the overall design of the mattress, it has won several awards and endorsements. It is approved of by doctors and thanks to the fact it has earned the GREENGUARD certification, it will never emit odors. It is a dual firmness mattress, which means that it is able to grow as your child does. When your baby is ready to move out of the crib and into a toddler bed, you simply take the mattress with them. One side is firm enough to support an infant. The other side is a little softer and more toddler friendly. However, it uses wave support technology to ensure that both sides are comfortable to sleep on. 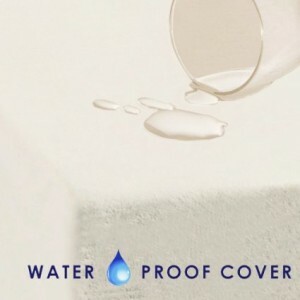 The mattress is covered by a surface that is waterproof. This means that baby spit up or leaky diapers, potty training accidents all be wiped off easily. You will not have to worry that your child may be sleeping on germs. 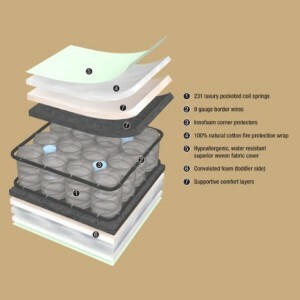 Even the seams where it is sewn together prevent moisture from getting inside of the mattress. This mattress is hypoallergenic. It is not made using anything that may harm your baby. There is no latex or wool inside of it. There are also no springs inside of it. The filling is purely cotton and pockets of air. The fact that the Naturepedic organic cotton crib mattress are seamless does mean that it will curve a bit toward the edges. Do not worry, this will not pose a danger to your little one. They will not roll toward the edge because it is soft enough to keep them where they need to be. Even as your infant does begin to roll around, you should not be concerned because the mattress fits tightly against the crib rails. It is one of the best mattresses according to many parents because the organic material it is made of is completely nontoxic. There is nothing inside of this mattress that will make your child sick. One of the biggest issues with this mattress is the weight of it. It is a full 50 pounds, which does make it a little difficult to move around for some people. According to Naturepedic mattress reviews, this mattress does have a slight plastic feel to it, but there are no plastic noises with it. For some people this is not a deciding factor for whether they love or hate it. Additionally, some feel that it measures wrong and that it is not a 52inch mattress. However, most parents do not seem to be concerned about this because it is not much smaller than the 52 inches. 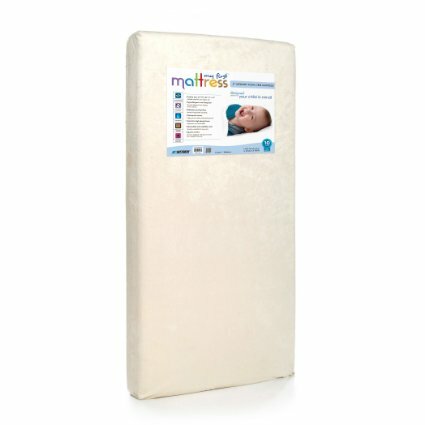 Is the Naturepedic Baby Mattress a Good Choice? Buying a crib mattress is not easy for most people. They want to know that when they put their little one to bed at night that they will be comfortable, and more importantly safe. However, most people still want to know that they are not blowing away money on something that they will use only for a year or two, and then have no further need for. That is where a crib mattress that serves a dual purpose can be most helpful. A crib mattress, such as the Moonlight Slumber Little Dreamer mattress, could be the right choice for your “Little Dreamer”. What Makes the Little Dreamer Special? 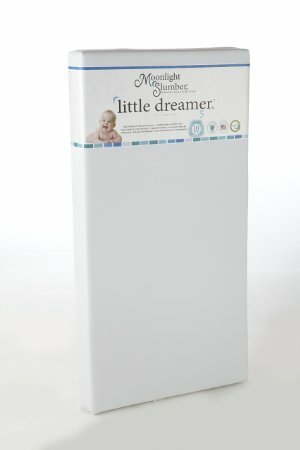 According to the Moonlight Slumber Little Dreamer reviews, this mattress is great because it is free of all of the potentially harmful elements that your little one does not need to be around. It contains no vinyl, polyethylene, lead, phthalates, or PVC. However, it still remains waterproof, regardless of which side of the mattress you are using. 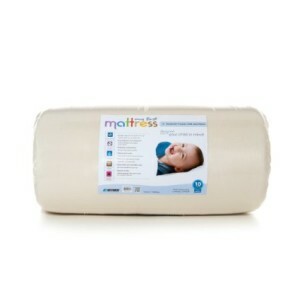 This mattress is ideal for both infant cribs and toddler beds. You simply flip the mattress over to change from one bed to the other. The infant side is created with an extra firm, high-density foam and the toddler side is made with firm high-density foam. This ensures that the bed will remain comfortable for your little one as they grow and prepare for a normal bed. 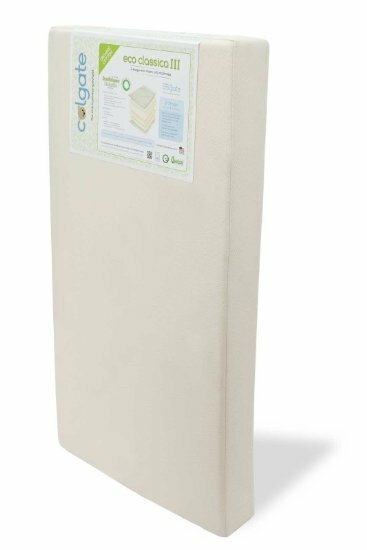 The high-density foam does have CertiPUR certification to further give you confidence that your baby and toddler aged child will be safe while sleeping on it. When it is time to flip the mattress from one side to the other, it will be a breeze because it only weighs 10.3 pounds. It does have side stitched seams to prevent the mattress from getting worn where your little one sleeps. You will not have to worry about a weak stitch causing a hole where your baby rests their head. If the stitches do come apart and you end up with a hole on the side, your investment is covered by a lifetime warranty against all possible manufacturer defects. This mattress is hypoallergenic. It has been treated with ultra-fresh to give it antimicrobial protection. If you need to wash this waterproof mattress, you simply wipe it down with a damp sponge, let it dry a little and put the crib sheets on. It measures out at 52.7×28.4×6.2 inches. 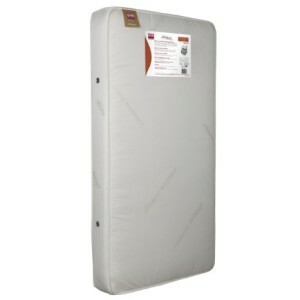 This ensures that while you are using it for an infant crib mattress, it will fit snug within the crib, in most cases. You will not have to worry about your little one sliding off the mattress, even after they begin wiggling and tossing around in their sleep. It is also 5 inches thick so that when your little one is in the toddler bed, you do not have to worry about the style of the bed. The mattress will fit snuggly inside. This mattress is made in the USA. 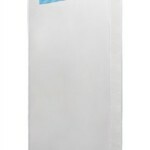 It meets or exceeds all the safety requirements of an infant mattress and has been approved for toddler beds as well. Some of the reviews for this mattress are from people who have already used it from infant to toddler. They have children who have used it for three or four years already and still the mattress is in excellent shape. These parents purchased it because of the fact that it was made with foam rather than springs, which many feel is a better choice for their child. Foam is also lighter and easier to work with. The parents who just purchased it say that it does not have any odor like what they have noticed with some of the other crib mattresses that are available. According to the many reviewers, the length of this mattress is slightly off. There may be a gap at the foot of your infant’s crib, however, this could be simply that the crib is a little longer than average. 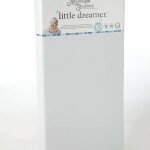 Is The Little Dreamer Crib Mattress Best for Your Little One? 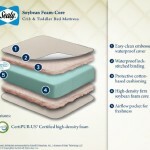 If you look at other breathable crib mattress reviews, you will find that this is one of the best available. Others may have some odor or they may not meet the same safety requirements. 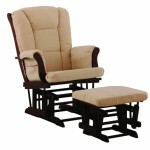 However, the firmness is an issue for some children who simply prefer a little softer sleeping area. Firm is recommended for infants, but that does not always mean that they want to sleep on a very hard surface. Overall, if you are like most parents, you should be totally happy with this mattress’s durability and overall quality. There are a lot of things to consider when you are trying to find the perfect crib mattress. It should be firm enough to keep your little one safe, it should be comfortable enough for your toddler if you hope to use it with a toddler bed, and you most likely also want it to be hypoallergenic. There are a lot of 2-in-1 crib mattresses available on the market, but choosing the right one for your new bundle may be difficult. 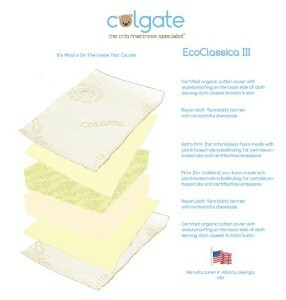 The Colgate Eco Classics III is designed to make your choice a little bit easier. Simply read the Colgate Eco Classics III and learn why many parents feel it is the best choice for their little ones. This crib mattress offers dual firmness. This means that it is hard enough for an infant to sleep on comfortably, but soft enough for a toddler to enjoy and all you have to do is flip the mattress. 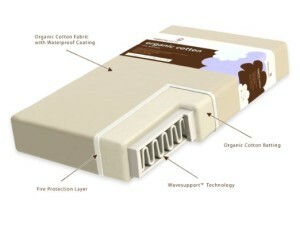 It has an organic cotton cover over a lightweight foam filling. The cotton cover also features a waterproof backing so that you do not have to worry about any wetness seeping into the mattress. It is the standard size for a crib mattress, which means it can fit well into any crib or toddler bed. It is six inches thick,which is the perfect orthopedic size for kids. The thickness also means that crib sheets will fit tightly so you will not have to worry about your little one having their sheet come off during the night. This mattress holds the GREENGUARD seal of approval. It meets or exceeds all of the expectations regarding indoor air quality requirements and protects your child from over 10,000 volatile organic compounds. Along with this, it also meets the requirements for resisting flame and chemicals. Inside the mattress, there is a foam filling and it is CertiPURE US certified to be friendlier to the environment and your little one. This Colgate crib mattress uses plant oils to help prevent germs and bacteria. This is much better for everyone because it replaces the petroleum based oils that some mattresses use. 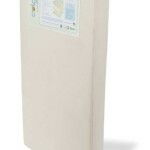 The Colgate Eco Classica III dual firmness eco-friendlier crib mattress is also very lightweight. It weighs only 9.4 pounds. This makes it easy to move around when you switch from the crib to the toddler bed and it also has inverted seams to make it look great no matter which bed type you are using it in. When you read through the Colgate mattress reviews you will find a lot of mixed feelings. 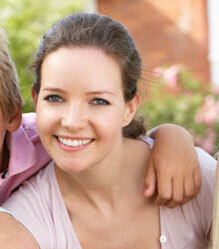 The parents who love it, truly feel that they are doing the right thing for their children. Either they enjoy that it is lightweight and eco-friendly or they just feel as though their little one sleeps great on it. It is firm enough to be safe for newborns, but soft enough to be comfortable. Some parents recommend though that you still purchase a waterproof cover for the mattress because the waterproof cover that wraps the mattress is not removable. The people who felt that this mattress was not up to their standards, feel that way because they feel it is not truly what it claims to be. There are people who feel that it was mislabeled to say it is organic when it isn’t or they had issues with the way it was sewn together. Should You Choose This Crib Mattress? When trying to figure out how to pick a crib mattress, you will discover there are a lot of factor to look for. You will want for it to be comfortable, but safe, you will want to ensure it does not have chemicals inside of it, and you will want to know that you are getting a mattress that you can trust to last from infant through toddlerhood. The mattresses made by Colgate should be considered because, after more than 50 years, they have perfected their design & quality. Read through more owner reviews to discover how over 90+ parents have given this mattress a 4.4 out of 5 stars. Although the product is slightly on the high price side, the dual features prevent parents from having to buy multiple mattresses. However, that does not mean you should settle on this one without reviewing other products, because there does seem to be some misleading information about whether it is “organic” or not. If you want to be safe and know that you are getting the organic mattress you are paying for, you may want to consider the Naturepedic Organic cotton crib mattress instead.